Her house is surrounded by juniper trees, the inspiration behind her book-length poem Dhoopi (The Juniper), and later when we walk into her wild garden full of roses and angelias, Toya will look like a dandelion puff, floating in the green, wearing a crown of soft white hair. 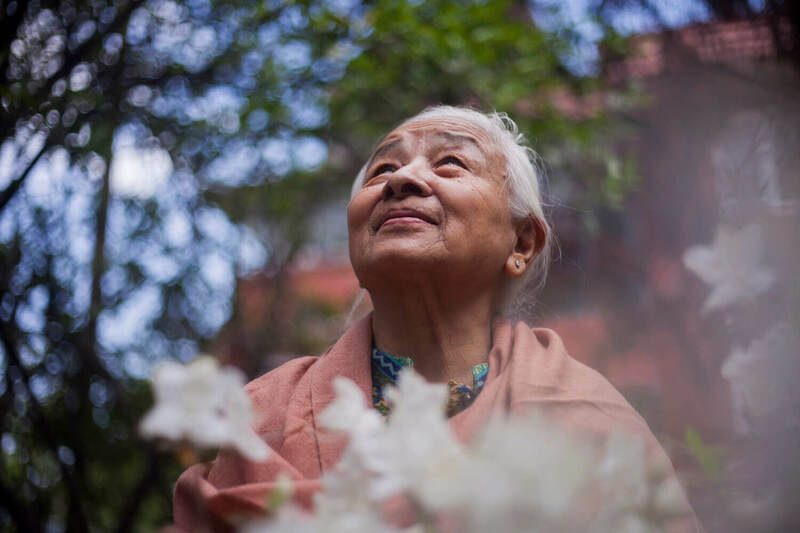 Born in 1947, Toya Gurung is the oldest of seven siblings (6 daughters, 1 son) and lovingly called Thulnani (eldest girl child) by her family and dear ones. Since her father was in the Nepal Army and posted at various places, Toya spent much of her childhood travelling around Nepal and India. In her 56-year writing career, she has published two poetry collections (Suryadaha, Dewal Ghumepachi), two long poems (Dhoopi, Punarawati), a collection of stories (Kusum), and as of last year, a period-memoir (Asprishya) written in an unconventional form of diary entries, poems and memories that span the two-year period leading up to Nepal becoming a republic. But these books were published quietly: no launches, no fanfare. “I don’t want to make noise,” she says. 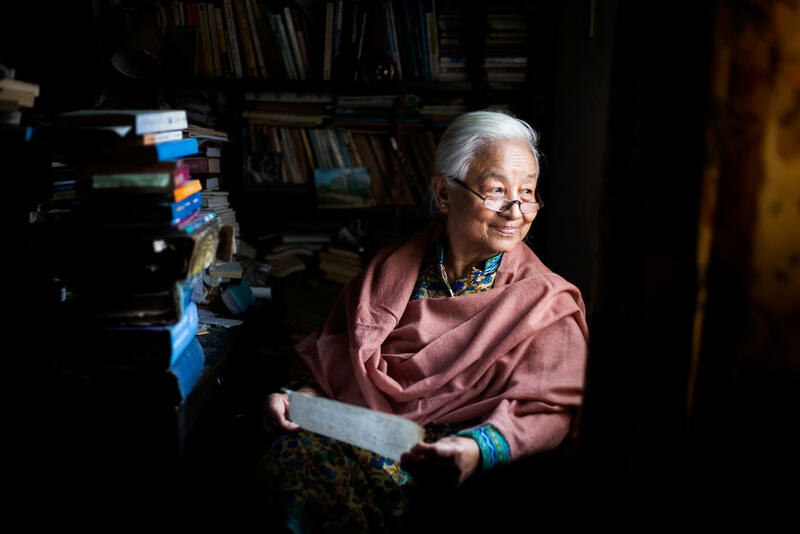 Toya was the country’s first female academician to be invited to the prestigious Nepal Academy where she headed the poetry department from 1999-2004. Toya’s poems are not only read widely in Nepali universities, but they also have an international audience. 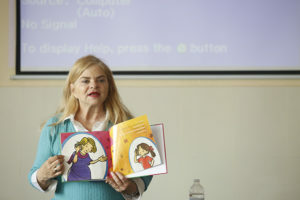 Translated by Ann Hunkins, some of her poems have appeared in Norton’s Language for a New Centuryand in Dānta, a literary magazine from the University of Notre Dame. 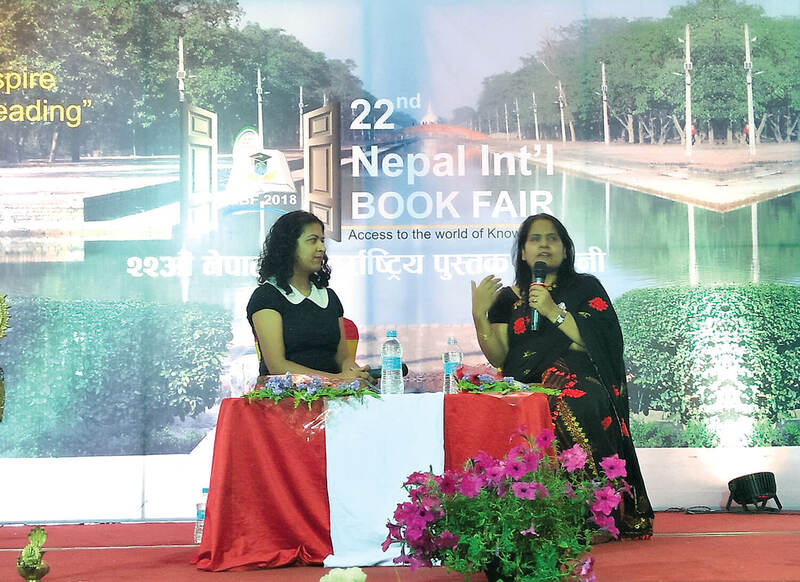 Writer Manjushree Thapa best describes Toya’s writing as ‘taut and hallucinatory … that suggests rather than tells, evokes rather than explains’ and the tone as ‘often wry, playful, and ironic, unlike much of Nepal’s poetry, which tends towards being emotionally wrought’. 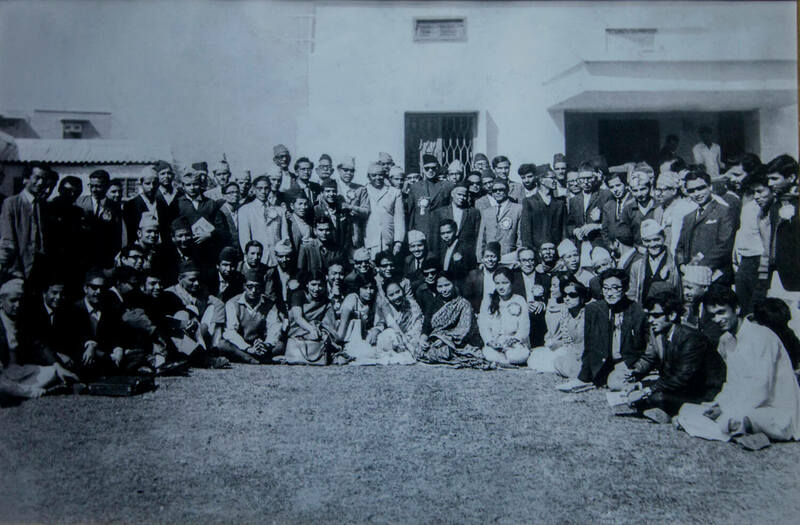 Toya Gurung (sixth from right, sitting on front row) at literary convention in Biratnagar, 1971. Toya Gurung: In 1971, Kedar Man Vyathit, who was the chancellor of Nepal Academy then, asked me to recite a poem. I had just graduated from Morang College in Biratnagar and was lucky to be part of a literary gathering there. 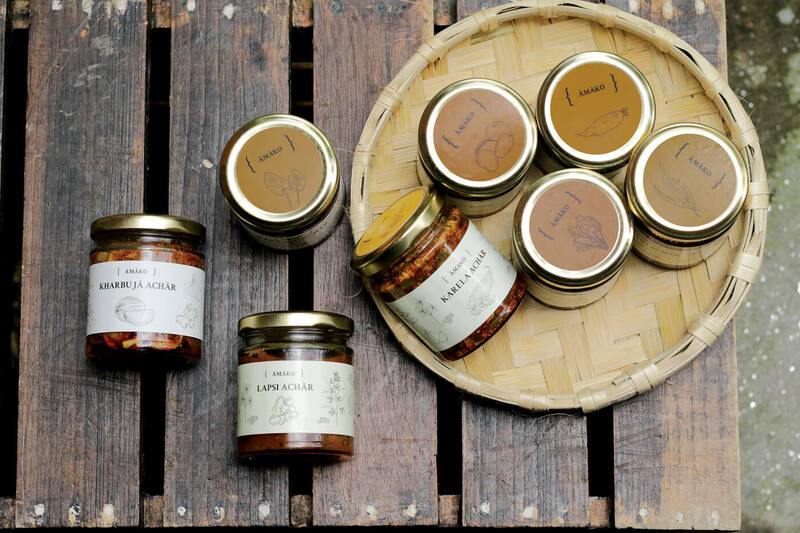 I had recently written Shataabdi Pagleko Odaarsita Manche, a poem about my apartment, it was a small bedroom and a kitchen, and the kitchen walls and ceiling were completely black because I cooked with firewood. It felt like I was living in a cave, thus the title. Vyathit loved it and told me that he would publish a collection of my poems from Nepal Academy if I could bring him 50 of my poems. 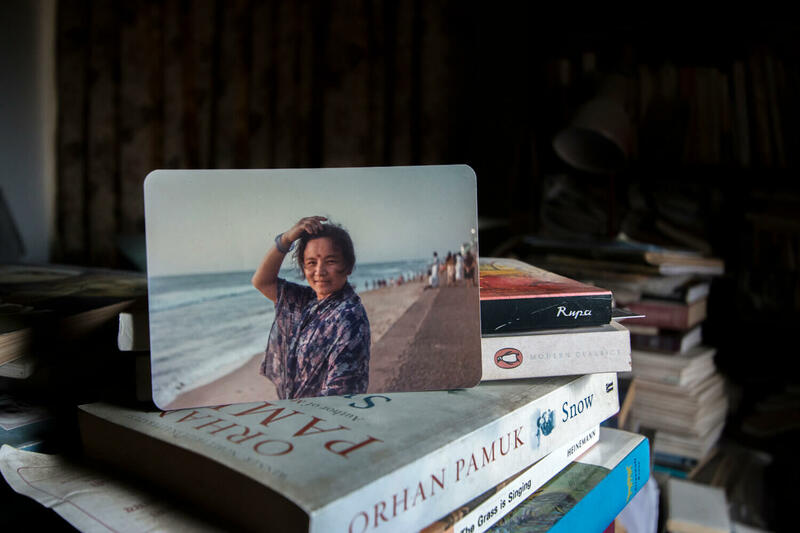 Muna Gurung: A book deal after a recitation? That is incredible. T: Yes, but it was like that back then, being published was not as complicated as it appears to be today. If people truly loved your work, you were in. Certainly, I was overjoyed. I was only 24 and a famous writer from Kathmandu was going to publish me. I had been writing for 3-4 years then, so I easily gathered 50 poems. 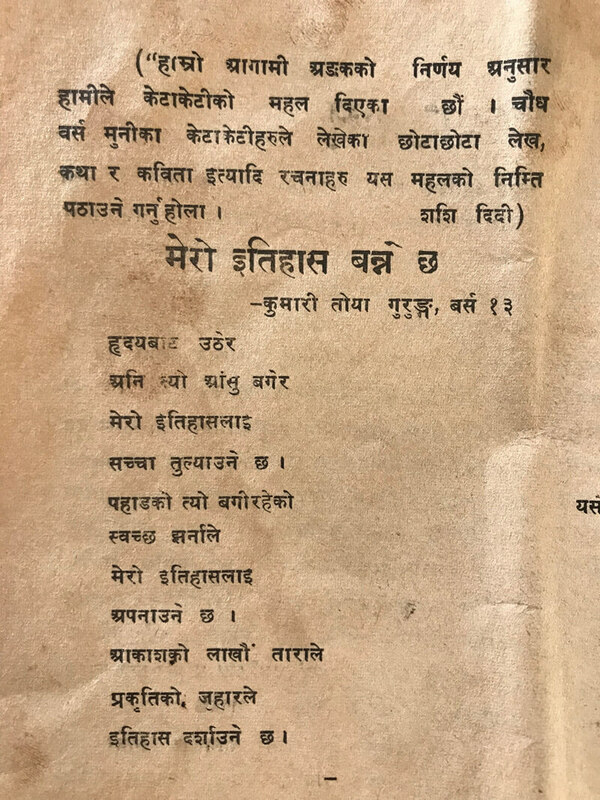 In 1972, our convocation was happening in Kathmandu, so I arrived with my poems. Later, when I asked the Academy if they had published the poems, they said they had lost the manuscript. T: Who does that? Maybe someone just thought it was trash and threw it away. I was so sad, I cried for days. You cannot re-write poems you had written at that age — those poems were gone from me. And I did not think to make duplicates. M: We never do. Even with all this technology today, we still lose manuscripts. That is such a sad story. T: I cried to Muwa, who was wise and never spoke much but always knew what to say to me. She said, Thulnani, where will your talent go? Nowhere. It is in you. Do not cry. You were born to do this, so keep writing. From Toya’s Colombo days in 1983 at Galle Face, Colombo. Every evening she would go on a walk with her husband, Kumar Ghale, and eat from all the food vendors along the beach. M: Your mother was a poet. T: By far a bigger poet than I could ever be. She never went to school but she grew up around a lot of Hindu scriptures written and recited in verse. Her knowledge was vast and her wisdom unmarked. In 1971, she was visiting me in Biratnagar from Chakraghatti, where she lived. I was working at Nepal Bank to support the education of my brother and sisters. Anyway, there was a literary event happening in Dharan then, I didn’t go. Apparently, poets had recited late into the night and all my contemporaries had gathered. They returned back to Biratnagar in the middle of the night. Goman Singh Chamling, poor thing, he was probably sad that he didn’t see me there. He came outside my house at 3am and began shouting, Toya baini, Toya baini, why didn’t you come share a poem?We all heard him but none of us spoke. The next morning, Muwa scolded me, This is the kind of crazy people you hang out with? I am sure when you get married, you will only have books with you to take as dowry. M: You included this in your period-memoir, Asprishya. In it you say that you took her words as a blessing and not as a scolding. T: I keep everything Muwa said to me, it is my possession, my wealth. One time, I was sad and told her that I had nothing in this world, not even a handful of soil to my name. She said, This world, this earth, the trees, the skies belong to everyone. Why do you make your heart so small? You do not need to own things, Thulnani, everywhere is your home. You can stay wherever you like. M: It seems like she held and shared such light. And she never discouraged you from becoming a poet, as most parents do? T: Never. In Charikot, I remember when I was a small child, my mother took these eggs from under the hen that hadn’t hatched for over 22 days. She took each egg and slowly cracked it one-by-one. I asked her, Did the chicken come first or the egg? She explained to me very calmly what she was doing: that the chicks were struggling, so she was trying to help them out. Later, I read about this in science textbooks. I grew around these kinds of interactions with Muwa. A day before I was born, she said that a jogi had come to her and blessed her with a daughter. I don’t know what you call this, manifestation of the divine? But here I am. M: It seems like you were desired and invited by nature. T: Yes, maybe nature wanted me to exist. And you, too. Because how did you come to literature? We are Gurungs, it’s not something we do. (Laughs). There are so many Muna Gurungs out there, but here you are focused on words, language and literature. It’s not an accident. Sometimes we choose things, but many times we are chosen. M: I think I came to writing in a clumsy way. But you, you feel like a soft fire. Like you have always known you would be a poet. T: There were so many signs that I was bound to be a poet. When I was nine, my Buwa told me that I should go to Calcutta and widen my world. On the train there I met a singer from Darjeeling, I have a feeling it was Karma Yonzon. He told me I had a good voice and that I should sing. At the school in Calcutta where I studied for three years, the headmaster, Kamal Sharma, was Nepali. For India’s 10-year Independence Day celebrations, he asked me to recite a poem in front of the school. Why me? Why a poem? I don’t know. We used to live by the Ganga, and I would see children swim in it. I wrote a poem about going to swim in the Ganga but having to encounter a floating corpse instead. When Kamal sir read the poem, he scrunched up his nose and asked me, You actually touched the dead body? He told me that maybe it wasn’t appropriate for the occasion. (Laughs). But that was what came out of me. Then later in Bhojpur, where I went to school with Manjul, every Friday we had this program called Of Ann Speech where we had to pick a piece of paper out of a ceramic urn and do whatever it asked us to do in front of the entire school — it could be dancing, singing, jumping, whatever. T: I have no idea. But that was what it was called and it was great. Every Friday students got to take a risk and perform. One Friday, Manjul’s piece of paper said he had to sing a song. He was well-dressed in a fitting daura surwal, cloth shoes, a Dhaka topi on his head. He belted out a song. Then it was my turn; my piece of paper read, Recite a poem. Again, why a poem? T: Yes, so I recited Mero Itihaas Bannecha. M: That is cited as your first poem ever. You mean to say you just spoke it off the top of your head? T: Absolutely. I stood up, I looked at the mountains around me… I mean this school in Bhojpur was on top of a hill, surrounded by great beauty. I closed my eyes, listened to the waterfall in the hills and when the wind blew, the words to the poem came out of my mouth. M: It is surreal. And the poem is clairvoyant. You were 15 and you so boldly saw you were going to make history. T: (Smiles). These days though, I feel like all the accolades, recognition, they are nothing. I am all by myself. When Doris Lessing was given the Nobel Prize, she was old and seated on her front porch with a grocery bag. Why give this prize to me now? What use is it? she had asked. There are very few people who truly understand the pain of a poet, a writer, a thinker. Maybe that is why I feel lonely these days. I used to share my sorrows with Muwa but she died five years ago. My husband, who loved me immeasurably, who never raised his voice at me or uttered a single hurtful word, also passed away three years ago. I have sisters and my brother, but they have their own lives. Sometimes I feel like I have become a book. Who will write about me now? No one. These days, I wish that the night did not exist. At least during the day, I get to see people walking around, there is life. M: I want to echo your mother: but this world, this earth, the trees … it is yours. What you have written will never go away. I love that writing has a quality of a time machine. You write today, and someone 500 years later might find your words and feel like you wrote just for them. T: That is true. I loved reading Wordsworth and his two poems Lucy Gray and The Solitary Reaper in 8th grade. I don’t think he imagined a Nepali girl in Bhojpur would be reading them! Both the poems were about hill women and I saw myself in them. I, too, wanted to write about my country, the soil, the way we laugh. When I write, I think about how my poems will land in this world. My writing should be as close to the ground as possible. If I lift it even a little higher, it will be spoiled. But I’m sure many will pick up my poems and see how simple they are and ask, Why do we even call this poetry? But if they look closer, they will find my life in them. 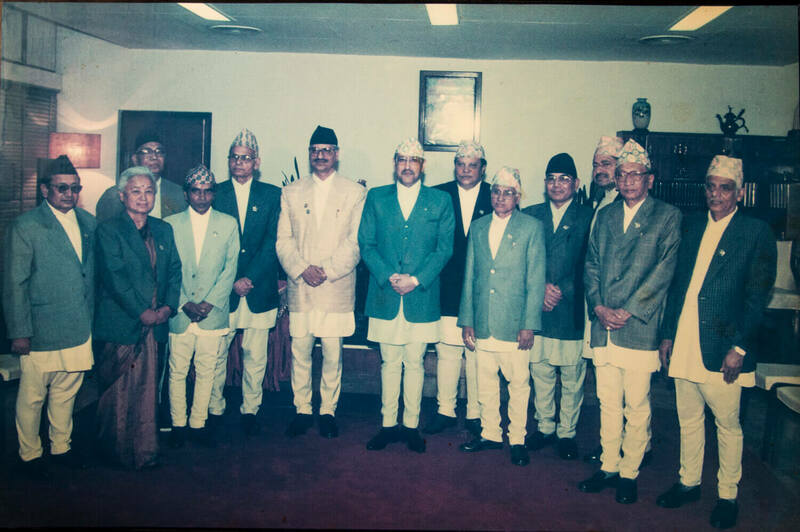 Members of the Nepal Academy with late King Birendra in 2000. M: My friend and poet, Christina Olivares, says that a poet’s job is to observe the world with accuracy and honesty. In the first chapter of Asprishya, you observe a crow eating a baby magpie for at least a page. T: Observation is everything. For my first book of poems, Suryadaha, it was the Sri Lankan sun that I observed every day. My husband worked for RNAC then and was stationed in Colombo. Our house was three blocks away from the railway tracks, and after that, the ocean. I had never seen anything like that body of water: vast, unforgiving and kind at the same time. And the ocean met me at eye level, it was not like a mountain and neither was it below me. There were large black rocks and in the crevices lovers nestled in pairs. I watched every sunrise and every sunset, that is why the title. It felt like the sun came with its own water. But sometimes seeing alone is not enough. Or some peoples’ visions are blocked, or inadequate. My friends ask me, Why do you write such simple poems?And I ask them in return, What did you get by writing convoluted ones? I use simple words. No one has to use a dictionary to read my poem. But they come from very deep within me, I thoroughly feel them grow and then they rise up. M: What, then, do you think is a poet’s job? T: Simply put, to write poems. But also to know when to write, what kinds of poems to write, and why. When I was in my early 20s, I wrote poems about everything I saw: the flower, the stone, the mud. Now, when I write about the same flower, I have to think so much more. Because as poets we are offering our thoughts, our ideas, and we have to think about how they will be received by our readers. M: I did the math and you worked full-time for 23 years at Nepal Bank. You moved from the Biratnagar branch to the Kathmandu branch. Clearly you didn’t just write full-time. When did you find the time to write? T: I could not write full-time, because literature is not a shop, it is not something that has immediate return. And maybe that is not something we should wish out of it either. So, I had to work 10AM-4:30PM. But in between bank vouchers and punching numbers, I would slip away and write. In my later years at the bank in Kathmandu, I was promoted to look after an entire department, so my office was on the top floor of the New Road Bhugol Park building. There was a bakaina tree outside my window that gave me shade and invited sweet breeze. I wrote many poems at that window. I would look over the roofs of all these Newar houses: they dried their clothes, food, shoes on these roofs, and kids would play there too. The poem, Madhyanna (Afternoon) as translated by Manjushree was written then. There was a boy and a girl playing doctor on the slanted roof, pretending to give each other injections. But you know, later they cut down that tree. I was so sad, I wrote Rukh Guliyo (Tree Sweet), which Ann later translated for an American literary magazine. Taken in 1980. There was an event at the Academy and when it was over at 8PM, they went to Photo Concern in New Road to take a photo. 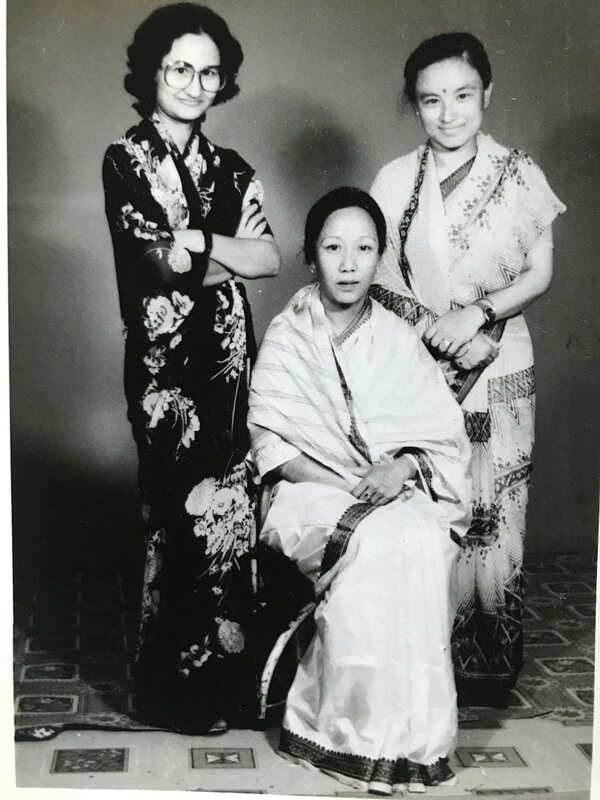 Toya with writer Anita Tuladhar and singer Aruna Lama . M: You would write poems at work and revise at home? T: Once I write a poem, I do not touch it too much. I think about it a lot beforehand. I play with the words, move them around in my head, and the poem stays with me for a while before it comes out onto paper. I wrestle with it a little, but I do not stop until I finish the poem. The other ladies at the bank knew not to disturb me if I was scribbling away. Once I am finished with a poem, I hardly go back to mess with it again. M: That is not the case with me or most fiction writers I know. For me the act of writing itself is thinking, 90% of writing is me messing with it. So, you write everyday still, and poems too? T: Yes, even if it is 3-4 lines. I write a poem every 2 or 3 days. Being alone is hard but it is also the best for writing. I do not have to talk to anyone. I just think, read, and write. I make two small meals for myself. I pretend to sweep and clean. When I do housework, I get dizzy. When I am reading or writing, I feel relaxed. But my hands and finger joints hurt so I cannot write for too long. My legs hurt so I cannot sit or stand for too long. Some days, I have to wear a neck brace. All this pain makes me want to cry, but I do not. There is no one to console me. Instead, I just listen to the radio. M: What are you writing about now? T: I am working on another collection of poems, this one is called Dilruwa, cause my heart is crying. M: That is interesting because doesn’t dilruwa also mean beloved in Urdu? T: Yes, it does. I read the Poetry Foundation’s magazine online every month, and in one of the pieces, the character’s name is Dilruwa. It was written by a Pakistani writer. So, I am keeping the title. Lightroom Conversation is a monthly page in Nepali Times on interesting figures in the Nepali literary scene. Last month’s guest was Maya Thakuri. We don’t have a culture of hugging. Besides those closely related to us, touching another’s body disgusts us. I was not disgusted by Brenda. She and I had a spiritual connection. When she was by herself, we would eat with her. It was because of her that we did not move elsewhere throughout our time in Colombo. The civil war started. For a long period of time, we could not eat what we wanted to eat, or go where we wanted to go. I used to wear a tika on my forehead. She said, “Don’t wear a tika. Those who wear tika are seen as separatists.” I listened to her. There was a door between the kitchen in the annex where we lived and her living room. That day, the door was unlatched. I pushed it open and saw that in her living room, she had beautiful large wood-carved cupboards full of western books. One by one I got a chance to read many of them. I fell in love with East Wind West Wind by Pearl S Buck. I wanted to ask her for it, but I did not . She probably would have given it to me, but I read the book and put it back in the shelf. Many times, I wanted to sit with her and talk to her about her books. Maybe because she knew I had some interest in literature, when her husband came back from Russia, she showed me a tiny book. It was maybe an inch and a quarter long, an inch and a quarter wide, and very thin. The words in this book were miniscule. I looked through the book, and was happy to have had a chance to see such a thing. Then another day, I found myself at the door again. I pushed it open. Her dog was there. His name was Timi. Next to Timi, a coiled up green snake. I was scared to walk to where the books were. Timi was sound asleep. What is the relationship between the dog and the snake? I stood by the door and looked at them for a long while.